What are Romans 1:16-17 and Romans 3:22-23 all about that to be the catalyst for change and reformation of Martin Luther? We know that the verses from Romans 1:16-17 were used by God, to be the catalyst for Martin Luther to commence what we call the Reformation. But what is it about these verses, caused him to think like that? Please do download the podcast using the link below and hear what this message has to say for you today in the 21st century: some 2,000 years after they were written and 500 years after affecting Martin Luther - words which are still alive and active today. G’day and welcome to our series, 'Thanking God for the Reformation', where we are looking at and celebrating that momentous event in history, and including in that, Church history. These are extracts from the book “Heroes And Heretics Abound” available on Amazon sites. The 18th century is widely regarded as the ‘Age of Reason’ – the age of scientific discovery. Science was discovering the natural laws that governed the earth. Quickly God was become merely at best an impersonal observer and the supernatural, spiritual worlds and the divine inspiration of Scriptures were being denied. Within general society, the 'need for God' disappeared as science and philosophy felt they could explain everything without the need of a God or gods. For the church, this was a century of stagnation and decay. In the USA, the original evangelical fervour had faded into commerce and prosperity. However, there were glimpses of the Church being empowered. Not all was lost! There were still glimmers of the church still being alive! In the mid-18th century there was a spiritual revival throughout the USA and Britain. Come and hear more of this exciting adventure of Church History - the catalyst of which was the birth of the Reformation commenced by Martin Luther... We look to America and Jonathon Edwards and return to England and the Wesley brothers. The church is almost 2000 years old now. The Holy Spirit is still at work, empowering the church despite the Age of Reasoning and the wide-spread ignorance of the spiritual aspects of life. This is the last in this series! The story of the Church continues, and will continue until the object and source of the Church’s faith, Jesus Christ returns in glory just as He has promised to do! Let’s learn the lessons of Church History and give thanks to God for those who have gone before us and help make the Church what it is today. We are now in England in the early 16th century! Protestantism had commenced earlier in the 14th century with John Wycliffe who we looked at earlier. Wycliffe was the 'Morning Star of the English Reformation'. The main issue in the 14th to 16th centuries, as we have seen, was the movement towards 'None but Christ saves'. That is, the Gospel is good news for all of humanity, regardless of who they are, that nobody can earn their salvation, but rather salvation is a free gift from God for all those who choose to receive it. The main issue in the 17th century however, was 'None but Christ reigns'. How so? How did this Reformation come about? Download the mp3 podcast using the links below to learn more! Mary Tudor also know as "Queen Bloody Mary"
G’day and welcome to our series, Thanking God for the Reformation, where we are looking at and celebrating that momentous event in history, and including in that, Church history. These are extracts from the book “Heroes And Heretics Abound” available on Amazon sites. As we saw yesterday in Part 2 of this series, on 31st October 1517, Luther nailed his 95 Theses, statements against indulgences, to the Castle Church door at Wittenberg. Here are the opening 3 statements of Luther’s 95 Theses… Download the audio mp3 using the link below to hear them all… They may not be as you think! These are extracts from the book “Heroes And Heretics Abound” available on Amazon sites. Change is gathering apace and we now see a great split. 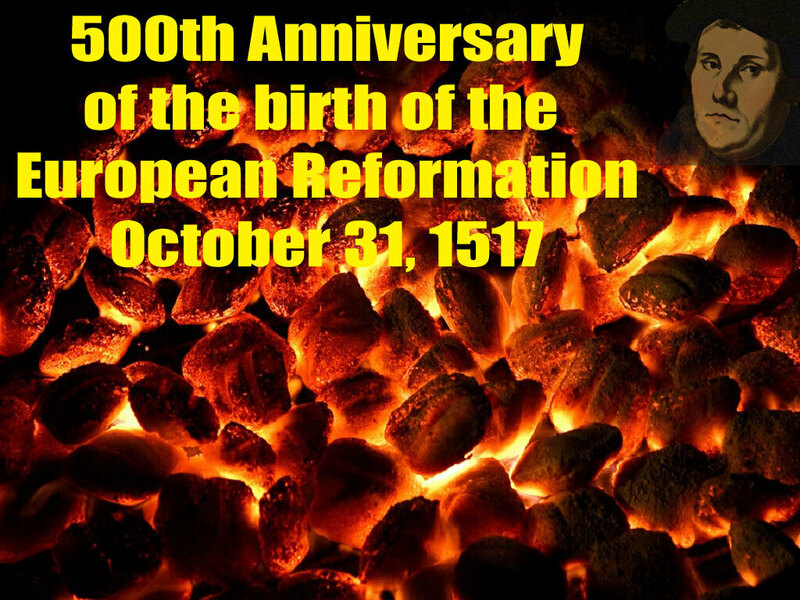 A split from within the Roman Catholic Church – the beginnings of the Protestant Church. Our main person we will look at is Martin Luther – one of the very giants of Church history. Luther was the Professor of Biblical Studies at Wittenberg University in Germany. Luther tried to find God as an Augustinian monk but he was unable to come to terms with God's righteous demands. He eventually realised through prayer and reading the Scriptures, that he could do nothing of his own to fulfil or satisfy God’s righteous demands upon him. He came to see that justification before Almighty God was by faith alone, through grace alone, which was a gift of God. Included in the aftermath of this discovery, were these key dates and events as the Reformation of Christianity and the Church gathered pace. 1517: Luther’s 95 Theses, statements against indulgences were nailed to the Castle Church door at Wittenberg on 31st October He rapidly gained a following in Germany, and was aided by the advent of the printing press. 1519: Luther publicly denied the supremacy and infallibility of the Pope and Church. 1521: Diet Of Worms. Luther was outlawed by Emperor Charles V of Spain. He was hidden by friends for 8 months, during which he translated the New Testament into German. 1528: Diet Of Spruger. A change in German law allowed each German State to follow the religion of its reigning prince. Once announced, change of religion was forbidden. 1529: Diet Of Speyer. Decides the Lutheran states were to remain Lutheran and the Catholic states to remain Catholic; not allowed to change. Evangelical princes protested at the restriction and the name Protestant was given to this movement. 1530: Diet Of Augsburg. Protestants submitted a statement of belief which was rejected, but became the basis of Lutheran doctrine. 1547: war broke out between Catholic and Protestant states. This war was won by the Catholics, but Protestantism was finally recognised legally in 1552. Consubstantiation - a 'real presence' of Christ's body with bread and wine though not that the bread actually became His body. As opposed to transubstantiation held by the Roman Catholic Church which says the bread and wine becomes the flesh and blood of Jesus. Infant baptism as necessary for salvation.